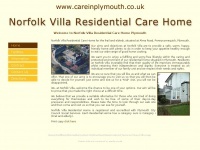 Norfolk Villa Residential Care Home for the frail and elderly, situated at Alma Road, Pennycomequick, Plymouth. We want you to enjoy a fulfilling and worry-free lifestyle within the caring and protected environment of our residential home situated in Plymouth. The web server used by Careinplymouth.co.uk is located in Great Britain and run by Namesco Hosting THE. There are many websites run by this web server. The operator uses this server for many hosting clients. In total there are at least 366 websites on this server. The language of these websites is mostly english.